I am sure you have heard all kind of things about Ibiza. Endless parties, huge clubs, paradise beaches, celebrities in expensive yachts, luxury hotels, etc. You can find all of that, but also places to relax and enjoy this fantastic island. You can easily avoid the party crowd and spend an amazing time with your family and friends. Or you can join the clubbers and party all day/night long. Nonetheless, the best you can do is go and explore by yourself. 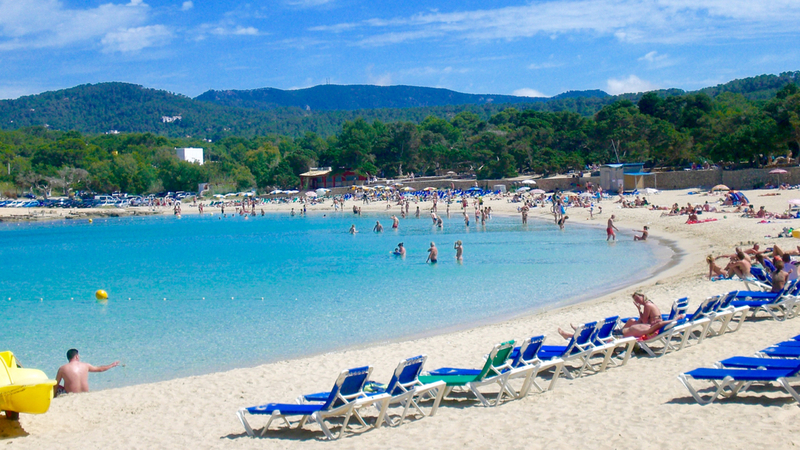 Playa d’en Bossa is the best area to stay if you want to party. Space (now Hi Ibiza) and Ushuaia, two of the most iconic nightspots are located in this neighbourhood, and with only 100 metres in between. One of the main streets is “Carrer de les Alzines“, where you can find some good pubs for pre-party. One of them is called Deja Vu, which is also 20 metres away from Sankeys club. If you walk 10 minutes you can find the other main street, which is called “Carretera de Platja d’en Bossa“. There are a few good pubs and restaurants on this road, which leads to Ushuaia and Space. 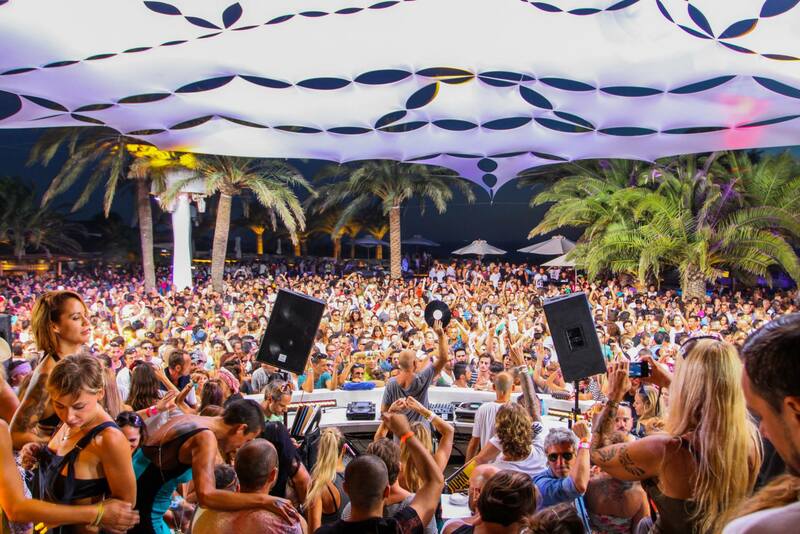 But just before these clubs you can find Bora Bora Beach Club. This one is famous for the after beach parties, including some that are next to a swimming pool from their apartments. During the day its beach gets crowded, with music and pretty club promoters. 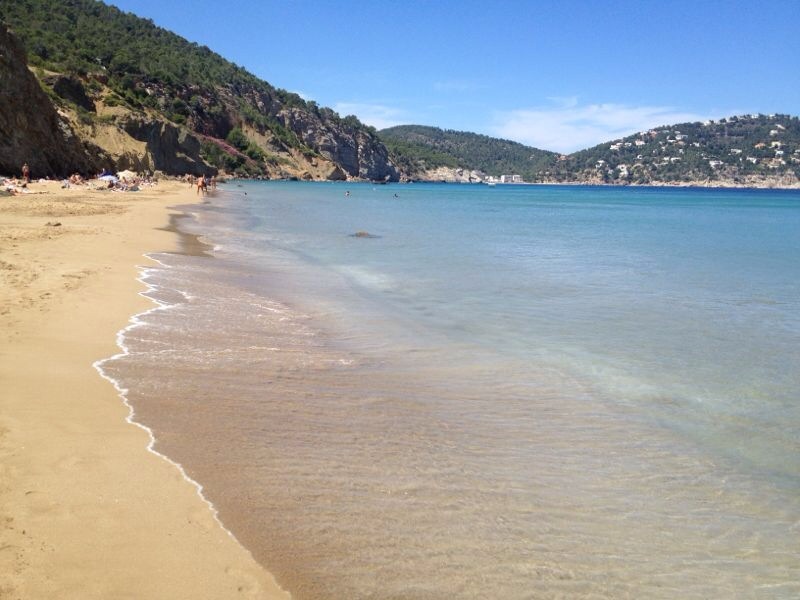 The downside of Playa d’en Bossa is that the beaches are not as beautiful as the others. Its strongest point is the party and not relaxation/sightseeing. 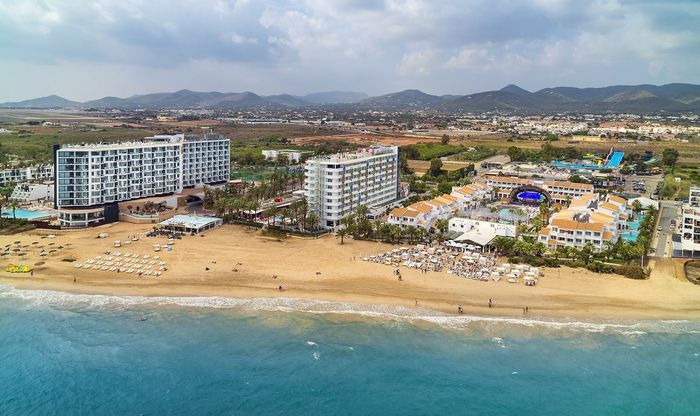 Mare Nostrum and Club Can Bossa are good options for accommodation. Last year I stayed in the latter, good value for money (decent breakfast and swimming pool) but there was no free wifi in the rooms (only in the hall). If you are looking for quality, check Garbi, Palladium Palace and Hard Rock. Or the trendiest, world famous and more expensive Ushuaia. This is the considered the “British” neighbourhood, so you can imagine its audience. It is the base for most clubbers, who spend the pre-party time before hitting the clubs. Like in the rest of the island, you can find cheap (in the West) and expensive establishments, and also resorts with all kind of facilities. 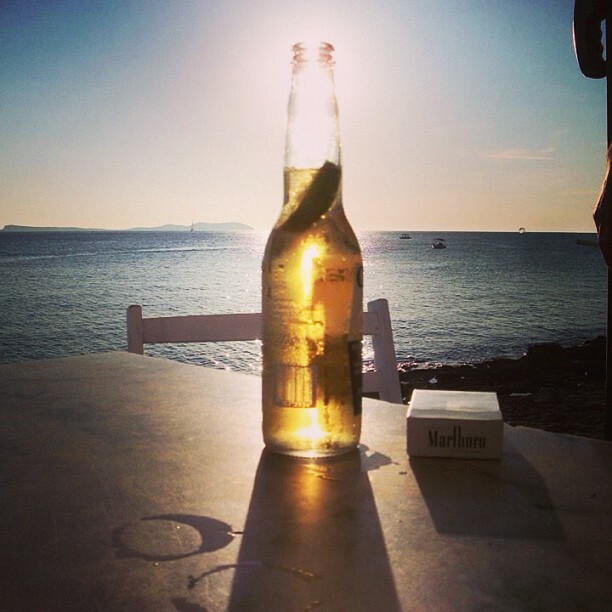 Its two most famous pubs are Cafe Mambo and Cafe Del Mar (one is next to the other). 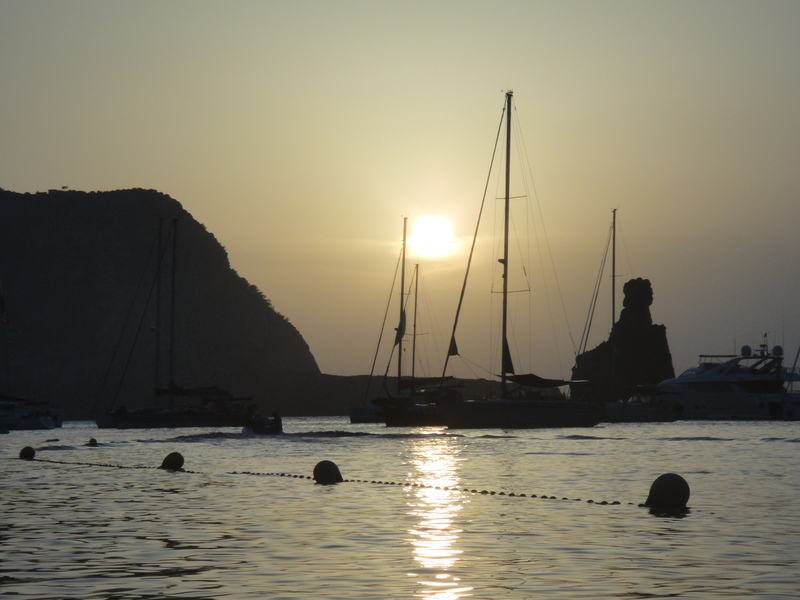 The latter is well known for its music compilations and wonderful sunsets, an iconic spot on the island. And finally, Ibiza Rocks is also in San Antonio. It is another famous hotel and club, especially known for its live music. The main town of the island. The old town is a nice place to walk around, with small shops, bars and restaurants. 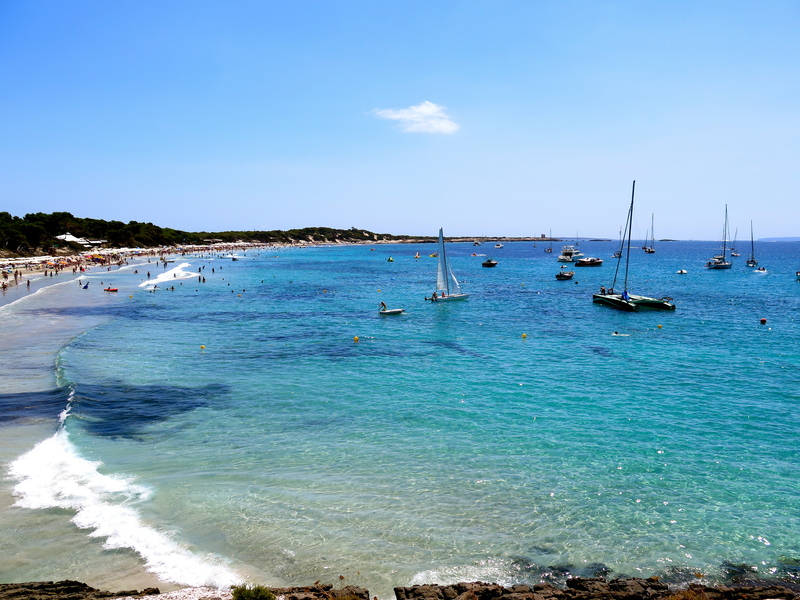 You can also find the harbour, where you can take boats to Mallorca and Formentera. This area is not as relaxing as others and it does not have pretty beaches. I do not think it is a good option if you want to party, although Pacha is nearby. But you can find other attractions such as great small boutiques, art galleries and museums (which are not the main attractions of the island). One restaurant I can recommend is S’Ametller. A pleasant mini walking tour is to take “Passeig de Vara de Rey“, then “Carrer de Riambau” and “Carrer de sa Creu“. You can find tiny streets and passages all around until you get to the harbour. The best area for families. It has a “more Spanish” feeling, with traditional food and a very relaxed vibe. It is a charming town on its own. There is a small river (see picture below) and an extensive beach with thin sand and crystal clear water. You can also find a good variety of hotels and apartments. This is another good area for families, away from noise and parties. It also has a wide beach with light blue water, and a great offer of hotels, resorts and apartments. 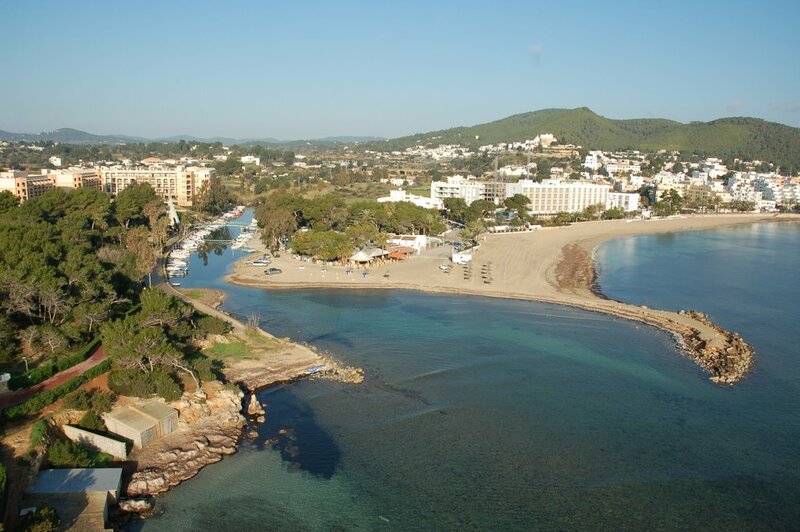 For those looking for something a little more familiar, both Cala Llonga and Santa Eulalia are the greatest options. 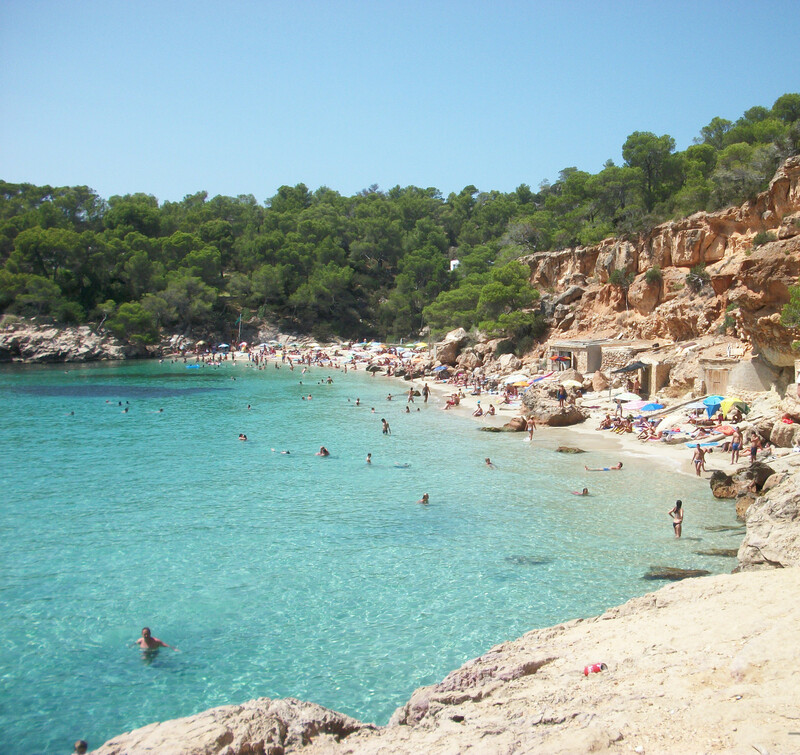 All Ibiza’s beaches (Calas in Catalan, Playas in Spanish) are beautiful, and a few of them are astonishing. This is my favourite. You should not leave the island without spending a day on this beach. 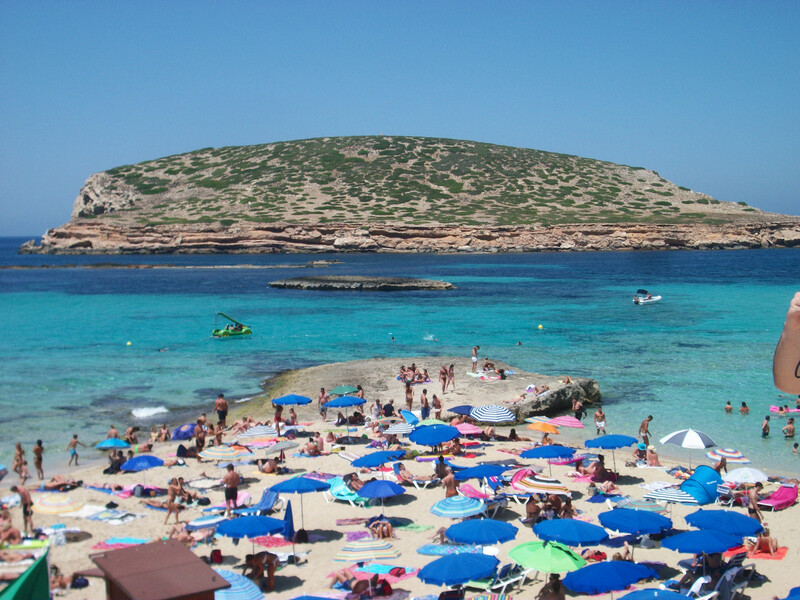 Combines a rocky coastline and sand dunes. It is really a “postcard-worthy” spot. You may need to climb a few rocks, depending on where you leave the car, but you will not regret. I would recommend going to the very end, which is on the opposite side of the restaurant and main parking (what you see at the end of the picture below). There are no facilities at that point, which is part of its charm. But you will find some guys offering smoothies, juices, beer and homemade food (you can get Argentinean empanadas). Probably the best sunset in the island. Again a rocky coastline, but with enough space to walk and swim (800 metres long, 15-30 metres wide). There is parking space if you go by car, and you can also get there by bus or ferry (departs regularly from San Antonio harbour). It is very popular and the pure sand area is not that big, so it can get crowded. There are a few rocky areas that make it interesting for snorkelling. If you like swimming you can target the island offshore (see picture below). There is also a very nice restaurant and bar called Sunset Ashram. This beach is less rocky than the others and very suitable to go with the family as well. It also has handy facilities: restaurants, beach bars, sunbeds, parasols, showers, toilets, changing rooms and massages. There are also some good spots among the trees if you want to avoid the sun for a while. You can rent pedaloes, banana-boat and jet ski. It really has options for everyone. There are four restaurants (Mediterranean, fusion, sushi) and a snack bar. It a has a large parking space, which cost around €5 and includes a Corona in the snack bar (bargain!). And finally, there are DJs playing a mix of lounge, chill-out and deep-house music all day. Ideal to avoid the crowd. It is far away so clubbers do not get there. It has an extensive beach area which also makes it suitable for swimming. There is a tiny bar/restaurant next to the entrance, and at the very end, you will find a nudist area (I do not think it is formally nudist, but you may find people with no swimsuits). Large coast with more facilities than the previous ones. You can rent a chair/umbrella and relax. There are a few “chiringuitos” offering food and drinks. It also frequented by locals. 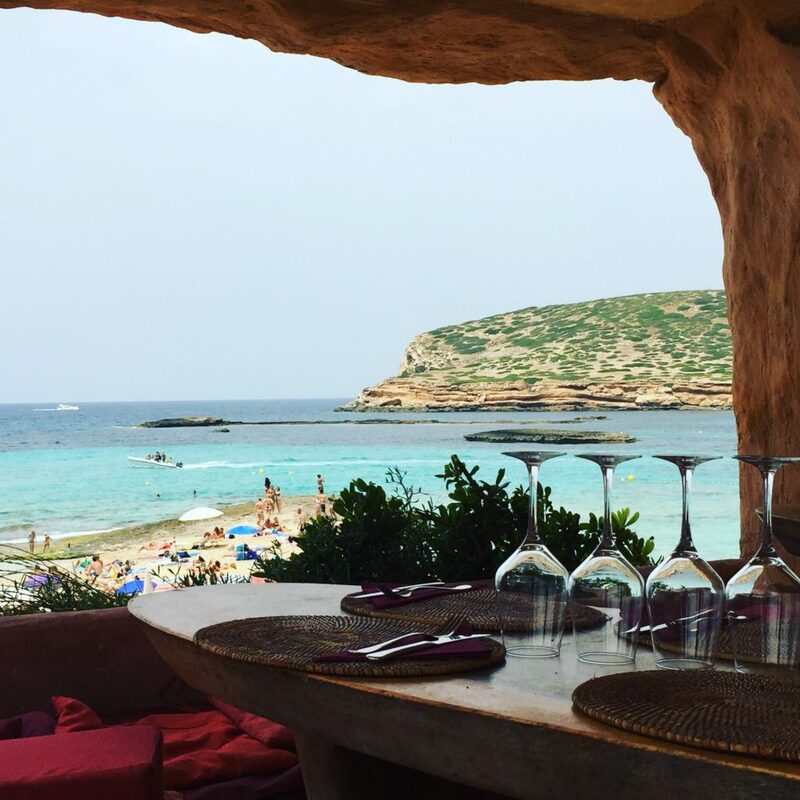 Towards the end of the beach, you can find Sa Trinxa Beach Bar. Very cool people and music. Unlike other places in the island, this place welcomes a hippie crowd and nothing pretentious. Famous for its sunsets and drumming Sundays. 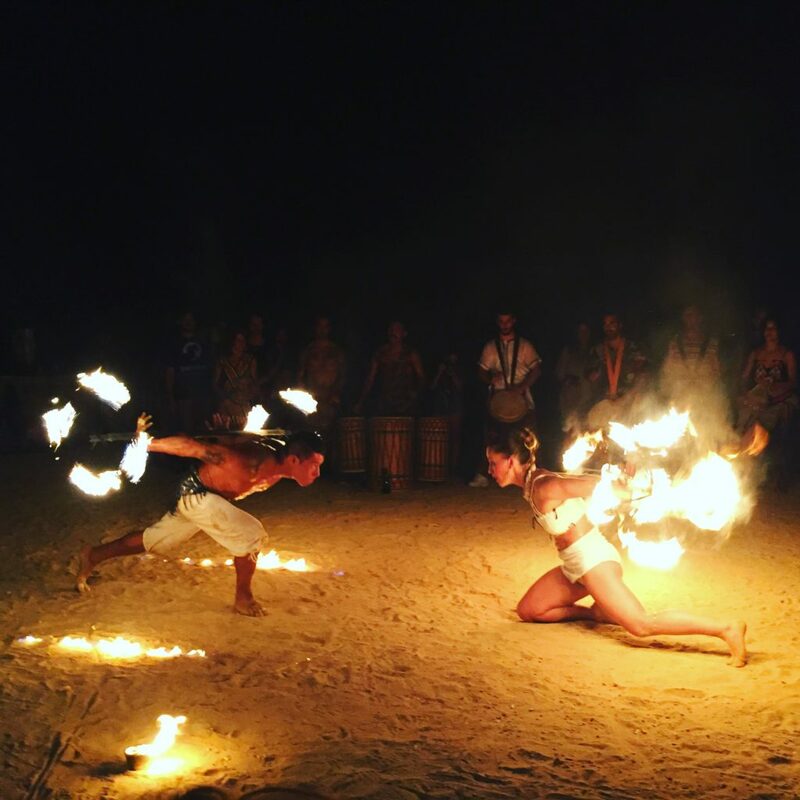 There used to be a ritual in the island in which the locals descend to the beach and “drum down the sunset”. A similar practice occurs every week in Benirras and has become a unique and iconic experience. There is also a small market (mostly clothes), a beach bar and three restaurants (I recommend the one called Elements). This particular event is quite popular nowadays, so it gets packed. There is a parking space but it is almost impossible to find a place in the afternoon. So you will probably need to park in a green area outside which is improvised for the occasion. I would strongly advise visiting Formentera. If you are looking to relax or you travelling with your family, this is the place to be. There are no crazy parties nor clubs like in Ibiza. If you do want to party, at least you can go for a day. 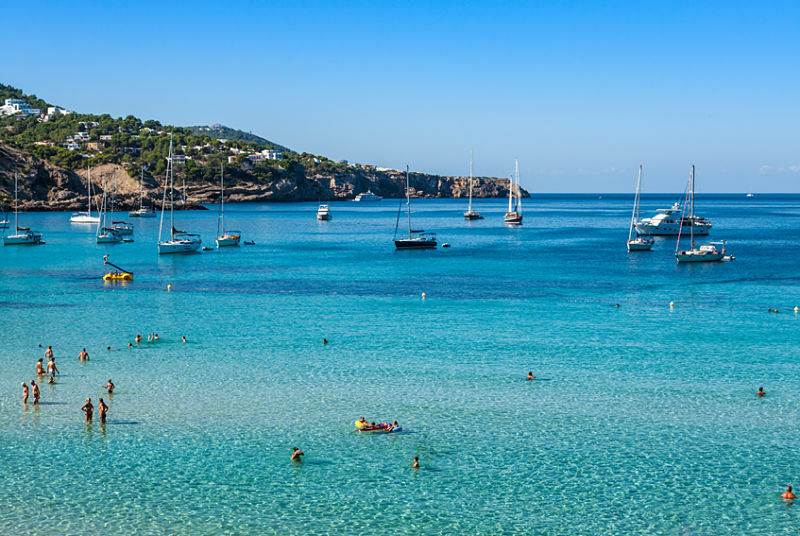 You can take a boat from Playa d’en Bossa or Ibiza Town in the morning and go back in the evening (the cost is around €25, check AquaBus for tickets and timetable). Normally you rent a motorbike as soon as you arrive in the harbour, and you use it to go around the island. “Playa de Ses Illetes” is one of the best beaches in the World. According to TripAdvisor, it is the #5 in the World and the #1 in Europe. With that being said, I would like to add what the locals say nowadays: Ibiza clubbing is not what it used to be. It is not as wild as before, with only a few after parties which are not that easy to find. In addition, all clubs will have to close at 6.30 am in 2016 [ReadMore]. Each club has its main day of the week. This is a tradition in Ibiza, a sort of unspoken rule and code between the clubs. So Fridays are Amnesia day, Saturdays are Pacha, and etc. That night is also when the most popular DJs play. And every party has a name as well. 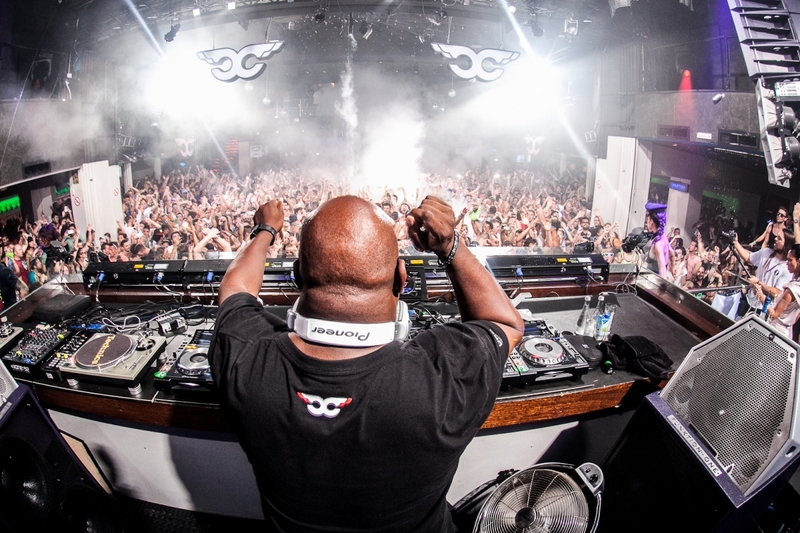 Normally there are a few trendy DJs every year (Luciano, Solomun, Marco Carola have had their peak time lately), plus some all-time legends such as Carl Cox and his Tuesdays in Space. So this is the way to go. It is useless to try to find “underground” or “less famous” parties. Ibiza is not the place for that. And one last piece of general advice would be to go in September/October for the closing parties. You can check the dates and even book tickets with plenty of time in advance [1, 2, 3]. This is my favourite, and number #3 in the World according to djmag.com. The 5000-capacity club contains two large rooms. One is darker, cooler and closes earlier. The other one is bigger and normally stays open until 9.30 am (even though it is announced to close at 7 am). The latter has also a terrace so the sun rays get into early in the morning, to become what they call the “sunrise dance floor”. 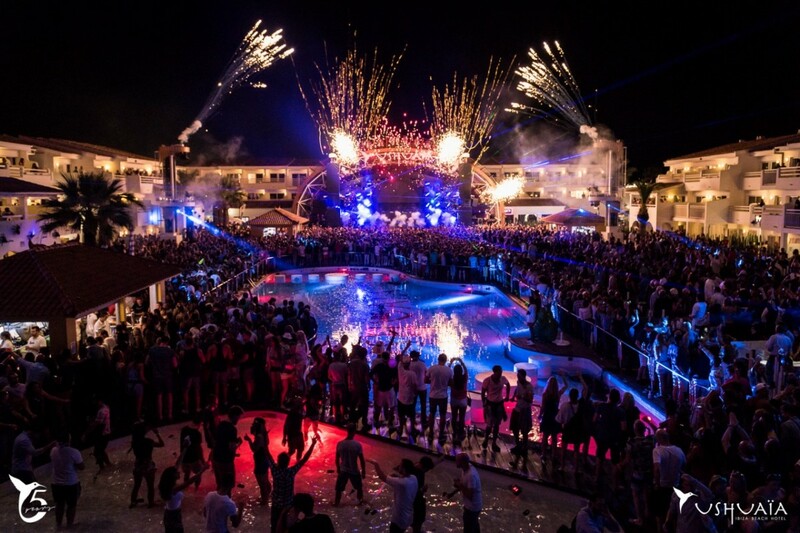 Some of its famous parties are Cocoon, Together, La Troya, Espuma, Cream, Music On, Matinée. 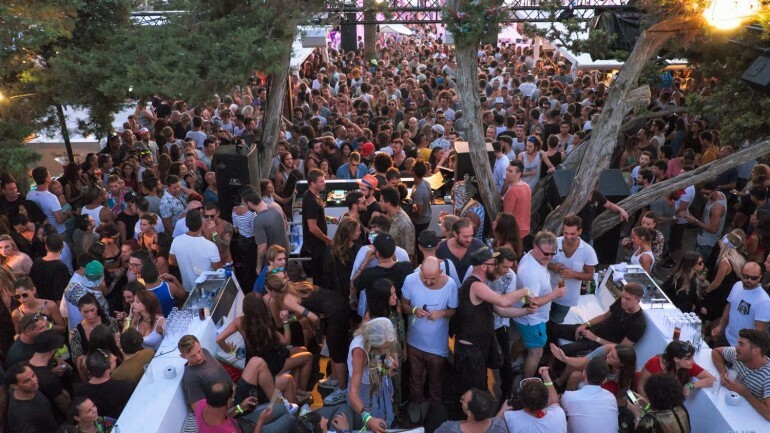 In the last few years, its best day was Friday with Music On, where Marco Carola played until late. Other good DJs playing here are Sven Vath and Ricardo Villalobos. A classic. Probably the most famous club in the world, and one of the island’s oldest clubbing institutions. You will find celebrities and people showing off in their VIPs. ResidentAdvisor provides an accurate description of the place: “The 3000-capacity venue has five different rooms: the large Main Room for house and techno, the Funky Room for more disco flavours, the Roof Terrace for lounge and chillout, and downstairs features Sweet Pacha for retro pop and the Global Room—the first main room back when Pacha opened in 1973—for R&B and hip-hop”. Saturday has been its main lately. Some of its famous parties are Flower Power, F*** I’m Famous, Pure Pacha, Vagabundos (from 2016). Some DJs playing here are David Guetta, Solomun, Bob Sinclair. 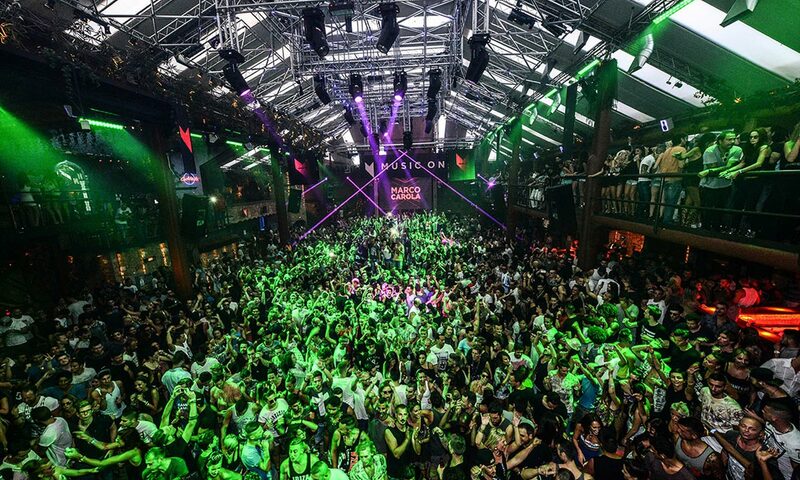 It is one of Ibiza’s oldest and largest clubs, number #1 in the World according to djmag.com. It has won a lot of awards and it is considered a party icon. It is especially handy if you are staying in Playa d’en Bossa. A very common plan is to go to Ushuaia until 12 am, to then take some rest and end up in Space. It has 5 rooms, 3 of them are partially outdoor. Techno legend Carl Cox did his final residency (the party was called Music Is Revolution) in 2016 after 15 years. Some of his guests will be John Digweed, Fatboy Slim, Luciano, Magda, Sasha, Marco Carola, Carl Craig and Masters At Work. This party is a must. Just across Space, this luxury beach hotel offers early open-air parties. It has two outdoor pools and a full-service cocktail bar. Lucky residents can enjoy these parties from their balconies. It closes at 12 am, which makes it a good and posh pre-party. Especially famous for its Monday daytime party called Circoloco. It started as an alternative place, to differentiate from the big clubs, to become a “symbol for the underground spirit of dance music”. It is located in a former airport hangar on the south-east side of the island. This 1500-capacity venue has 2 dance floor and a terrace. Be prepared for unexpected guests and decorations, which the main theme can be described as “Carnivalesque”. The “world’s largest nightclub” according to the Guinness Book of Records, with a capacity of 10,000 people. It is a multi-space venue with an indoor pool, chill-out room with garden, a dome with views of the island and even a Mediterranean restaurant. Because of its size sometimes some rooms are closed. It is also very close to Amnesia. Some good DJ’s playing there are Tiesto and Armin van Buuren. There used to be a good party called ElRow, which is now hosted by Space. This is the luxury resort owned by the same group as Pacha. Besides high-quality accommodation, they offer spa, yoga and free entrance to Pacha. There is also an open-air club and one of the best after parties in the island, which is normally after the main Pacha’s night. So if you find yourself looking for an after party, get a taxi and head to Destino. There is a small room in the basement which normally opens from 7.30 am to 11.30 am. Originally from Manchester, this club offers a “more underground” and “less pretentious” vibe. It is smaller than the rest of the clubs, and this is a reason for going and for not going at the same time. It is quite handy if you are staying in Playa d’en Bossa. One of its main parties is called Tribal Sessions. The poshest place in the island. The only one with a dress code, which is not that clear, but better to wear trousers and shirt. It is not far from the airport, but it is quite isolated and you need a car to get there. It is next to a rocky beach and it has a large open-air area. Very posh parties are thrown there, normally on after beach hours, up to 2 am. A lot of people get there by yacht. Its main day is Sunday. Chirincana is not a club at all, and it could be a great escape from loud electronic music, famous DJs, queues, etc. It is a small bar on the edge of a famous camping called La Playa (Ibiza Beach Camp). You will a diverse mix of people all ages and nationalities, plenty of smiles and a lovely and laid-back atmosphere, totally relaxed and completely unpretentious. Moreover, there is a stage with live music, and also entertainment from jugglers, acrobats and various performers (see picture above), as they can just gather just outside the bar and perform. Last but not least, tasty pizza and cold beer are always available. For some people this place represents the “true spirit of Ibiza”, and the island was originally home to the “hippie” community. Rent a car [EasyCar, EuropCar, Expedia]. The island has the right size to be explored by car. You do not need more than 1 or 2 hours to go from one side to the other. And sometimes it is not easy to find a taxi at all. 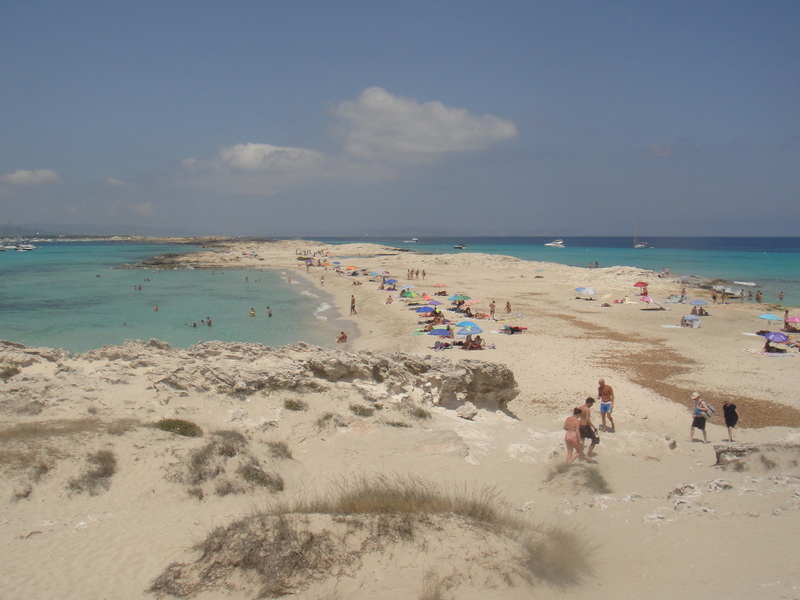 Moreover, the best beaches (Calas) are isolated and away from the neighbourhoods. Buy in the big supermarkets. 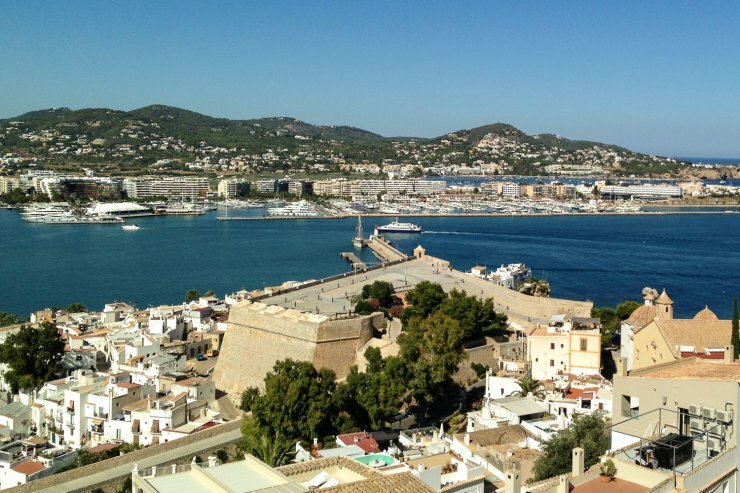 Ibiza is the most expensive place in Spain. Going to the big chains is the best way to spend less money. Mercadona is the best one, but you also have Eroski and Lidl. More info here, and the locations in the following map. Plan your boat trip in advance. If you want to visit Formentera (which you should do), find a boat and buy the tickets in advance. You will avoid a queue and save some time. Bear in mind that sometimes the boat moves because of waves and the wind, so be prepared to feel unwell (especially if you go after a hard night).